Closed-end lease based on new 2019 Optima (Model #53222) subject to credit approval, dealer participation, and vehicle availability. Offer shown based on $2,999 due at lease signing including $189 first monthly payment, $2,160 capitalized cost reduction, $650 acquisition fee, plus tax, title, license and registration fees, dealer conveyance fee, processing fee or optional service fee and any emission testing charge. No security deposit required. Offer shown total lease payments are $9,614. Actual payments may vary. Purchase option at lease-end for offer shown of residual value of $12,435.80. Lessee is responsible for insurance, maintenance, repairs, $.20 per mile over 12,000 miles/year, excess wear, and a $400 termination fee*. Lease offer applies to Optima (MSRP $23,915, includes freight, and excludes taxes, title, license, additional options and retailer charges). Actual prices set by dealer.Must take delivery from retail stock by 4/30/2019. Dealer contribution may vary and could affect actual lease payment. See dealer for warranty and lease details or go to kia.com. *Termination fee for all states except CO, IN, IA, KS, ME, OK, SC, WI, WV & WY. *WI termination fee: The amount of the base monthly lease payment or $400, whichever is less. *CO, IA, KS, ME, OK, WV & WY termination fee: The amount of two times the base monthly lease payment or $400, whichever is less. *IN & SC termination fee: The amount of three times the base monthly lease payment or $400, whichever is less. The current Taylor Kia of Boardman *NO GIMMICKS EVERYONE QUALIFIES* price is $23,650. With an original MSRP of $26,150 this 2019 Kia Optima LX has an immediate savings of $2,500! 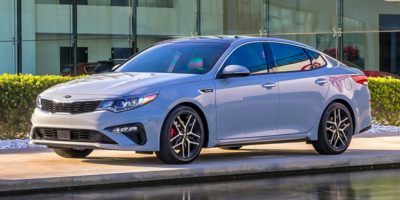 This 2019 Kia Optima LX features a Sangria exterior with a Black interior. Factory equipped with an impressive 4cyl, 2.4l, 185.0hp, and an automatic with front wheel drive. DESIRABLE FEATURES: Bluetooth, Aux Audio, Blind Spot Monitor, and Remote Entry. Your 2019 Kia Optima LX is one of 49 other models like this in stock Youngstown drivers will find available to test drive at our new vehicle showroom in Youngstown, OH. This Kia Optima is perfect for any ones car needs in our neighboring communities of Youngstown, Warren, Boardman, Canfield,& Austintown, OH. TECHNOLOGY FEATURES: This Kia Optima for sale near Warren includes Steering Wheel Audio Controls, an Anti Theft System, an Auxiliary Audio Input, a Electronic Messaging Assistance, Steering Wheel Controls, an MP3 Compatible Radio, Digital Media Storage, and an AM/FM Stereo. Stock # K191073 is priced below retail market value! Taylor Kia of Boardman New Kia Super center has this 2019 Kia Optima LX competitively priced for a fast sale today. Our Kia Dealership in Boardman, OH: Call Taylor Kia of Boardman today at 330-886-4942 to schedule your test drive of this 2019 Kia Optima LX! Taylor Kia of Boardman features a wide selection of new Kia vehicles for sale near Youngstown, Warren, Boardman, Canfield,& Austintown, OH. You can also visit us at, 7870 Market St Youngstown OH, 44512 to check it out in person! INTERIOR OPTIONS: a Power Drivers Seat, Cloth Seats, Bucket Seats, a Driver Illuminated Vanity Mirror, a Pass-Through Rear Seat, an Adjustable Steering Wheel, Air Conditioning, a Passenger Illuminated Visor Mirror, a Bench Seat, a Tilt Steering Wheel, Vanity Mirrors, and a Rear Window Defroster. Canfield new Kia dealers simply cannot compete with Taylor Kia of Boardman attention to stocking Kia cars, trucks & SUVs with the most popular interior options. When choosing Kia dealers Canfield, Ohio shoppers prefer the short drive to Boardman where Taylor Kia has a new Kia Superstore and has the best customer service. We’re glad you found this new Kia Optima for sale at our Kia dealership near you in Austintown, OH in Youngstown, OH. Looking for Kia financing? Our Taylor Kia of Boardman finance specialist will find the best rates available for this new Kia Optima for sale. Taylor Kia of Boardman has new cars for sale and used cars for sale in Youngstown just south of Youngstown, Ohio.